Where Will Kumihmo Take You? Everywhere! Have you ever learned a new beading technique that just sent you over the edge, creatively? Ever since I learned how to do kumihimo at Bead Fest Philadelphia this year, my brain has been on creative overload with all kinds of ideas for using this fast and fabulous Japanese braiding technique to make all kinds of beaded jewelry designs. I took my first basic kumihimo with beads class on a Thursday night, and by Saturday, I was ready to take Jill's "beyond the basics" class where we learned how to do things like add a focal bead in the center of a kumihimo braid, make a twisted kumihimo braid with a hollow center, and make a kumihimo cord with a clean end. 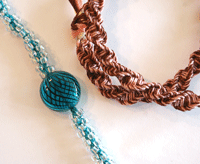 Buttons make great closures for beaded kumihimo bracelets and necklaces. 1. Make a necklace centerpiece. Sure, kumihimo bracelets work up fast with those lovely size 6o seed beads, but why not take that bracelet, make it a little longer, and use it as the centerpiece of a necklace? You can practice your finishing techniques for the ends using your favorite caps and cones, and then mix it up with some stringing or your favorite beaded rope. Mixing in a few gemstone beads or handmade ceramic beads will also help add character to your kumihimo necklace! 2. Make your ends a little longer for a button closure. I've got this wonderful bag of Italian metal buttons from Natural Touch Beads that are just begging for me to use them. Instead of using end caps or cones to finish off your kumihimo piece, why not make your ends a little longer than usual and use those braids to make a button and loop closure? Or make a necklace extension that can be removed and used as a bracelet by adding two button and loop closures to your piece. 3. Use your kumihimo braids for handles. When done properly, these beaded kumihimo braids are incredibly strong. I've got a handful of felted bags hanging around that are just waiting for beaded straps, and I think these beaded kumihimo braids are just the thing! I can use any leftover beads from the straps to embellish the felted bags. If you don't make felted bags, you can always add a strap to your favorite handbag or tote bag, too! Does it seem like I'm totally hooked on kumihimo? It's such a fun and easy beading project! My next ventures into kumihimo will be learning how to make braids with wire, creating my own beaded patterns for my round kumihimo braids, and using the square kumihimo looms to make flat braids instead of the round braids I've been working on for the last few weeks. When it comes to learning this new beading technique, it seems like kumihimo is taking me to some very cool places creatively! Necklace by Giovanna Imperia. 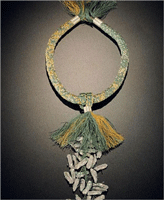 Image from Kumihimo Wire Jewelry. Photo by Jack Zilker. Now, if you know the basics of kumihimo and want to start doing some more exploring on your own, you need to check out Kumihimo Wire Jewelry by Giovanna Imperia. While most of the projects are designed to be made with wire, you can easily adapt them to your favorite fibers or nylon and satin cord. There are twenty kumihimo projects for both the round and flat disks, and plenty of inspiration for adding your favorite beads and chain as embellishments to your finished kumihimo jewelry. Get your copy of Kumihimo Wire Jewelry and find all the instruction and inspiration you need to take your kumihimo projects from easy to awesome! What's your favorite kumihimo technique? Have you been playing with new ways to finish your braids? Designing your own bead patterns for beaded kumihimo braids? Leave a comment and share your newest kumihimo technique discoveries with us!